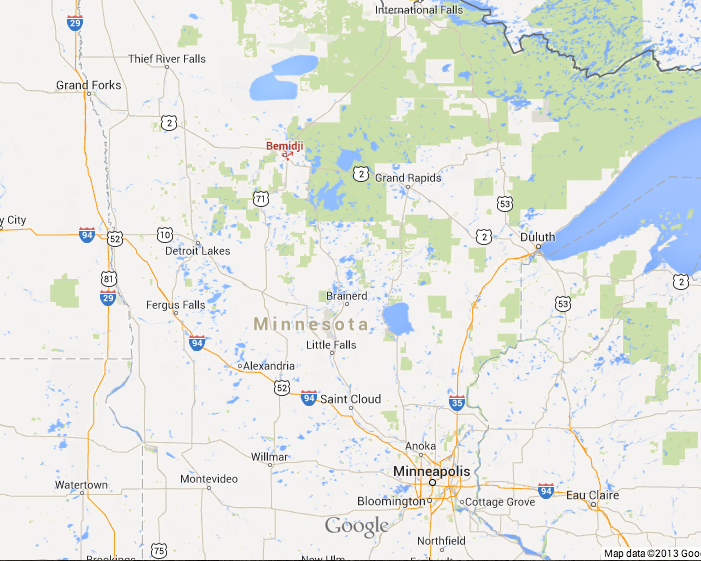 to Bemidji, Minn. to take on the Beavers of the WCHA. As we know, Miami turned in one of their worst team performances in recent memory as they were swept out of Omaha last weekend by the Mavericks 6-3 and 3-1. Nothing seemed to be working for the RedHawks as they suffered from horrific defensive lapses in transition, looked disinterested at times, and the offensive leaders — Austin Czarnik and Riley Barber — were remarkably quiet. In fact, you have to go back to November 8 at St. Cloud to find the last time Barber scored a goal, and Czarnik has only two in that same span. Needless to say, Miami needs to begin to find their game as they have just one more series (December 6-7 vs. Denver) before the holiday break. The nice thing about this year’s schedule, however, is that Miami has an exhibition game against the US U-18 squad on New Year’s Eve in Oxford that will help them shake off some rust before embarking on play in the season’s second half. Still, after this weekend, Miami will play just three games from December 6 to January 10. And, as an aside, if Miami loses Riley Barber to the US U-20 WJC team again, which is an almost certainty, it doesn’t look likely that he’ll miss any games for the RedHawks while he plays for another gold medal. Looking at Bemidji State, Miami (7-6-1, 2-4 t5th NCHC) has faced the Beavers (5-7-2, 5-4 2nd WCHA)) six times and has won four of the six matches. Of course, none of the meetings was more famous than when the RedHawks defeated Bemidji State 4-1 on April 9, 2009 in Washington D.C. That was Miami’s first ever national semifinal appearance and the victory propelled them to their only national title game appearance where they fell to Boston University in overtime. Offensively, the Beavers are led by a trio of skaters with 10 points starting with sophomore forward Markus Gerbrandt who is tied for the team lead with 8 goals on the season while junior forward Danny Mattson (2-8-10) is second on the team in helpers. Junior captain Matt Prapavessis (good luck with that one this weekend, Greg) anchors the Beavers’ blue line and leads the team with nine assists. In net for Bemidji State is junior Andrew Walsh who has started all 14 games this season. He brings a line of 2.82/.907 and one shutout into the weekend and has been a workhorse for the Beavers. Other skaters to watch include sophomore forward Cory Ward who is tied with Gerbrandt in team goal scoring with eight and sophomore defenseman Graeme McCormack who has a season’s line of 1-7-8 from the blue line. For Miami, finding their game this weekend could provide a huge boost as they move back into conference play next weekend at home against Denver. The RedHawks can ill-afford another listless weekend as they get ready for another conference test. If Miami wants to secure home ice advantage in the first round of the NCHC playoffs, they’ll obviously need to get things turned around over the coming weeks. taken a skate to the head) and normal Friday starter, Ryan McKay, did not look comfortable in net as he fought the puck all night. And, on Saturday, he wasn’t much better. Though he made 40 saves, McKay appeared to still be fighting the puck. All in all, let’s chalk last weekend up to a blip that happens to every team during the course of a long season. Hopefully Miami can rediscover its confidence and scoring touch and get back to playing solid team hockey that carried Miami to shutout victories over St. Cloud and Wisconsin earlier this month. Until Miami shows they’re committed to team defense and two-way hockey, and until the offense starts humming, there’s no way I’m picking a series sweep. That said, I think Miami ends the three-game losing streak, but I’m saying split in Bemidji this weekend. Greg Waddell will have the call of both games this weekend at Miami All-Access and over the air on AM 1450 and 1490 in the Oxford area. From last night. 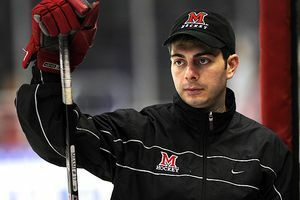 USCHO reporter Matthew Semisch’s quick interview with Enrico Blasi following Miami’s 6-3 loss to Omaha. He makes note that both Williams and Coleman will be fine and that Miami’s transition defense wasn’t very good last night which is precisely what we saw, too. 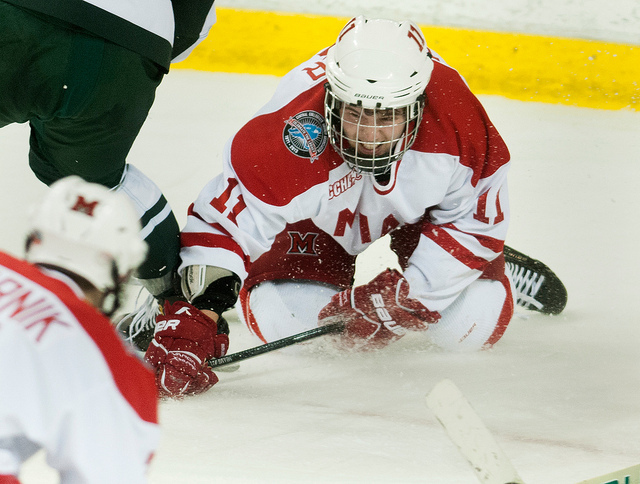 In a game that was a strange nightmare of this programs’ past, the Miami RedHawks were outskated and outcoached by a hot Nebraska Omaha team 6-3 on Friday night. Last night was reminiscent of games I’ve seen Miami play in years against Michigan when we didn’t have nearly as much talent as the Wolverines. 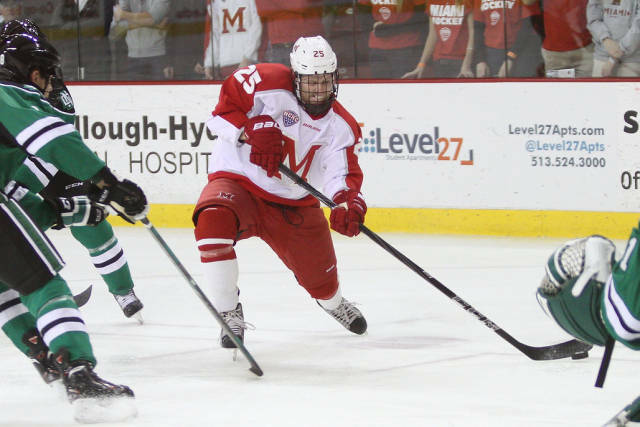 The Mavericks, stymied in the first period by Miami’s defensive system, broke out in the second period by scoring five times, largely off transition plays or rushes to overwhelm the RedHawks and seize control of a close game. It was clear that Dean Blais’ intent was to lure the RedHawks into an up-and-down game by sending three forwards hard through the neutral zone to create odd-man rushes. That effort resulted in several defensive lapses with UNO forwards routinely getting behind Miami defensemen who were outnumbered and flat-footed. The Miami forwards really have to do a better job Saturday night back checking to limit the transition chances for Omaha. When Blais upped the tempo, Miami simply had no answer. Cross-ice passes found streaking forwards in the neutral zone. Routine centering passes found tape, and then, the back of the net far too often. 5-1 and the game looked out of reach. But, as the second period wound down, Sean Kuraly would inject some life into his teammates by scoring a late powerplay goal at 19:36 and let out a loud “whoop” following it that was clearly audible all the way up in the press box. For the night, Kuraly was probably the best of the RedHawks, and at one point, was elevated to the first line alongside Austin Czarnik and classmate Riley Barber. And, just :19 after Kuraly’s tally, Kevin Morris would jam home a loose puck in front of the net and suddenly it was a two-goal game at 5-3 heading to the third. In the third, the RedHawks showed immediate life, but after having an early powerplay and exhausting energy putting pressure on the Mavs, by the 10 minute mark of the period, it was clear Miami had exhausted whatever power they had to forge a comeback. On the night, the RedHawks were 2 for 7 on the powerplay, but missed several other good chances. Junior captain Austin Czarnik will most certainly say that he let a few golden opportunities pass by as he was stopped twice by UNO junior goaltender Ryan Massa on a penalty shot and a clean shorthanded breakaway attempt. If Czarnik converts just one of the two, we perhaps have a different game down the stretch and the Hawk bench would have gotten a huge boost. As poorly as the RedHawks played transition defense, they did leave enough Grade A scoring chances on the ice that could have made this a game. But, in the end, UNO’s speed and transition game took the RedHawks by surprise and they looked unprepared and unable to respond. I think Dean Blais certainly got the best of Enrico Blasi on this night. But, the great thing about college hockey is there’s always tomorrow night. Saturday’s game is incredibly important for Miami. Finding a way to overcome tonight’s poor performance and earn a win will make the flight back to Ohio a lot happier on Sunday and reestablish Miami’s confidence heading into next weekend’s road series at Bemidji State of the WCHA. After being injured in the second period, sophomore netminder Jay Williams did not return to the game though he was spotted on the bench for a while after the injury and in the hall leading to the RedHawks locker room during the third period. We’ll try to get an update on his status, but it’s certainly clear that Ryan McKay will start Saturday night’s game. Junior Blake Coleman appeared to injure his leg in the second period, but did return to the ice in the third period and played reasonably well. Hopefully, he’ll be in the lineup tomorrow night and the injury is nothing serious. Junior Jimmy Mullin was scratched in favor of senior Bryon Paulazzo who responded with a goal and some gritty play in front of the Omaha net. And, I believe Paulazzo will be in the lineup Saturday night as well. Ryan McKay did not look like himself tonight in relief of the injured Jay Williams. He was certainly fighting the puck most of the night. Perhaps this game was just a strange anomaly overall, and we’ll look back upon it late in the season and agree it was just an off night for everyone. The CenturyLink Center in downtown Omaha is a nice “pro” building. However, it lacks character, a pep band and a full house which is why UNO is constructing a new building that seats around 6,000-7,000 on their campus about five miles to the west of downtown. Omaha controlled the faceoff circle winning 46 to Miami’s 32. Clearly the RedHawks must narrow that gap Saturday night. That’s far too many losses against a squad looking to get out into transition. We’ll have more to say later, but as it is, Miami falls 6-3 to Omaha in a game that was simply bizarre. Miami was flat for most of the 2nd period allowing 5 goals and never really seemed able to slow the Mavericks transition game down after the 1st period. Paulazzo, Kuraly and Morris had the Miami goals and Williams and McKay split time in net with neither looking elite. What an exciting 2nd period in Omaha as there were SEVEN goals scored as Omaha leads #8 Miami 5-3 after two periods. For the first 17 minutes, it seemed Miami was skating in sand. No life. No energy. And, getting beat back in transition. 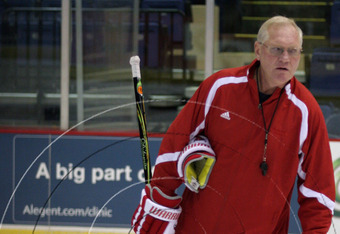 Dean Blais can coach. The adjustments he made to send an extra forward wide…Miami had no answer. UNO was able to get out in transition and use their speed…and they are fast! Jay Williams and Blake Coleman were both injured and left the game. Williams did come back out to the bench, but we’ll have to see if Coleman returns in the 3rd. He put no weight on his right leg as he was helped off the ice. Ryan McKay is extremely strong when he is down in the butterfly. However, his egregious, and careless, drop of an easy slapper from the point led directly to a goal that was unacceptable. He must focus and concentrate at all times. It looked as if he took it for granted. UNO is putting three D back on Miami rushes up-ice. They are limiting Miami chances to the outside and Miami got gritty on the PP and at even strength to score the last two goals of the night. Miami did not get to the net much in the period until the final few minutes. Ryan Massa’s save on Austin Czarnik’s penalty shot attempt was outstanding. He never moved. He out-waited Z and made the save look easy not biting on a decent head fake. Well, it looked bleak, but if Miami can get the next goal in the 3rd and make it 5-4, who knows? As it stands, UNO leads Miami 5-3 after 2 in Omaha.